Precision counting scales can be very helpful in counting small parts. These types of scales allow for items to be counted by a total weight instead of having to count each small part individually.. Counting Scales use a calculation system to count small parts by their weight instead of having to count each individual part manually. The user first places a small number of the parts on the scale. For example, the operator might place 10 parts on the scale. After pressing a button, the scale will take the total weight of the objects and divide by the number of objects that were placed on the scale to get a weight per object. Then, larger amounts of the object can be placed on the scale. The scale will now divide the total weight by the weight of one of the objects to get a total number of objects on the scale. There are several advantages that are involved with using counting scales as opposed to counting the objects by hand. There are also advantages as opposed to other types of scales. Although the same thing could be done with any scale, a counting scale performs the calculations automatically to make it easier to use. When a customer places an order, they expect to get what they asked for. Nothing can create a disgruntled customer more than to give them 99 small parts when they asked for 100. However, the small parts also create a problem in counting. It is very easy to get off-track, even when paying close attention. Some employees will compensate for this by throwing in extra product, just to make sure the customer is satisfied. This can result in higher costs for the business. A counting scale helps employees make sure that they give the customer the amount they asked for without giving away excessive amounts of product to achieve that goal. For any businesses that deal in goods, an inventory can be the lifeline of the company. A depleted inventory can send customers scurrying to the competition to get what they need. On the other hand, excessive overages in inventory result in unnecessary costs for the business. .A counting scale helps employees keep accurate records of inventory. When inventory counts are required, they can be done quickly and almost effortlessly with accurate results each time. With a counting scale, employees spend less time trying to sift through and count small objects. Instead, the items are placed on the scale and a count is determined quickly and easily. When customers get what they want, they leave a business in a good mood. Happy customers recommend a business to others and come back for repeat business. A counting scale can help to ensure that customers leave happy. Greater customer satisfaction means more repeat business and more referrals. This brings in even more customers, who will then become happy customers, themselves. Counting scales are relatively inexpensive and very affordable. Especially when considered in light of the potential benefits, a counting scale is a very good investment for any business that deals with small parts. Some businesses will need to use the counting scale in more than one place. The business could always purchase multiple scales to use throughout the building. However, this results in more expenses and seems unnecessary if the scales will not all be used at the same time. Counting scales are available in portable models. This allows them to be moved to any location, eliminating the need for separate scales at each place a counting scale is needed. Counting scales are accurate. A initial baseline measurement is taken before the actual measurement is taken. This establishes the base weight of one item. That weight is then used to compare to the total of items being sold or purchased. The capacity of the counting scale will also influence the accuracy of the scale. The scale must be a proper size to match the weight of the item. 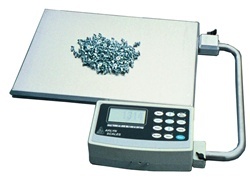 The capacity of counting scales may range anywhere from 300 grams to 300 pounds. The higher capacity scales would be much less accurate in weighing lighter items. A scale with a capacity below 3 pounds would be considered a high precision counting scale and would be much more accurate for lighter items. Choose the capacity of scale that is needed to complete your tasks. The best scenario would be to have a scale that was just large enough to accommodate the largest set of items that would be weighed. Although many counting scales perform general purpose tasks, there are counting scales that are designed for more specific tasks. One example of a more specialized counting scale is the coin counting scale. These scales are designed to distinguish between the weights of different types of coins and calculate how many of each coin has been placed on the scale. Unless a more specific counting scale is needed for a particular business or industry, a general counting scale usually works for most situations. Counting scales are very handy. They allow for items to be counted quickly and easily, making exponential improvements over counting the items by hand. However, the counting scale technology can be made even better by connecting it to the world. Both Ethernet and USB connections are available for counting scales. This allows the scale to be connected to computer systems to easily integrate with other software or allow instant recording or purchase or inventories. Before purchasing a counting scale, contact Arlyn Scales at http://www.arlynscales.com to find out how they can help you get the best counting scale for your situation.